The Paris Agreement to limit global warming goes into effect Friday. It’s stated goal is to keep the world from warming more than 2°C (3.6°F) above pre-industrial times. There’s just one problem: the greenhouse gas emissions reductions countries have pledged so aren’t nearly enough to meet that goal, according to the United Nations’ Environmental Program’s fifth annual emissions gap report published on Thursday. The carbon pollution cuts on the table from now through 2030 will put the world on a trajectory to warm 3.4°C (6.1°F) by 2100. In order to keep warming close to the 2°C threshold, the world will have to find a way to cut an additional 25 percent of its carbon pollution. Last year, around 39 gigatons of carbon dioxide was emitted globally. While the Paris Agreement will limit emissions, particularly in developed countries, a number of developed countries will still likely see their emissions rise over the coming decade. 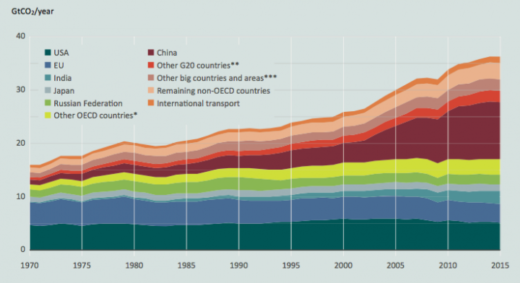 For example, China is expected to peak its emissions in 2030. That means the world’s cumulative emissions could reach 52 gigatons by 2030 — even if all Paris Agreement pledges are met (and that’s a big if). The findings are based on the concept of a carbon budget — basically how much carbon pollution the world can emit while still remaining below the 2°C threshold. The world is already halfway through the 2°C carbon budget. Current trends will take us well past the carbon budget for 1.5°C and right against the limits of the 2°C carbon budget. We've already come close to the 1.5°C threshold for a few months this year (which will incidentially be the world's hottest). To keep the world on a trajectory that makes 2°C feasible and doesn’t require even more drastic cuts, the world will have to find a way to cut an additional 12-14 gigatons of carbon pollution by 2030. Releasing this report so close to the Paris Agreement going into force and the climate talks kicking off next week in Morocco is an important reminder to policymakers that more has to be done. Climate change is an issue with little regard for wiggle room and the overdraft penalty for overshooting the carbon budget is steep. Entire nations could disappear under rising seas. Conflict, disease and food insecurity could become more common. Some of the ecosystems that support us could collapse. For all the bad news about the current trajectory, the report shows that there’s a path forward where the world closes its carbon emissions gap and stands a better chance of achieving the 2°C goal. Cities, private corporations and regional governments could play a big role in doing that. New York, for example, is planning to reduce its emissions 80 percent by 2050. That’s both a larger cut and a longer timeframe than the current U.S. commitment to the Paris Agreement, which is to cut emissions 26-28 percent below 2005 level in 2025. Energy efficiency could also help shave another few gigatons off the carbon budget overdraft, particularly emissions from buildings. Ultimately, the report shows that keeping global warming in check isn’t solely the responsibility of large government or small ones, but everyone on the planet.